The slogan of the Jordan Brand Classis is ‘Next Versus Next’, a reference to the fact that past game participants have gone on to become some of the most exciting superstar prospects in basketball. The game’s distinguished alumni include Amar’e Stoudemire, Carmelo, J.J. Redick, , Andre Iguodala, LeBron, Chris Paul, Dwight Howard, Rajon Rondo, Rudy Gay, Lamarcus Aldridge, Andrew Bynum, Tyler Hansbrough, Lou Williams, Kevin Durant, Eric Gordon, Derrick Rose, Tyreke Evans, DeMar Derozan, Brandon Jennings, Greg Monroe, Jrue Holiday, Tyreke Evans, Kemba Walker, Iman Shumpert, Demarcus Cousins, John Wall, Kyrie Irving, Harrison Barnes, Kendall Marshall, Tristan Thompson, Jared Sullinger, Perry Jones III, and Dion Waiters, among many others. Last year, Kentucky’s magnificent group of incoming freshmen – Marquis Teague, Michael Kidd-Gilchrist, Kyle Wiltjer and the superfluous Anthony Davis – gave the country a glimpse of the enervating package en route to Lexington, along with other skilled future diaper dandies like Duke’s Austin Rivers, North Carolina’s James McAdoo, Washington’s Tony Wroten and Florida’s Bradley Beal. This year’s star wattage was no exception, with a group of ridiculously skilled young men who are in the process of crafting their own future legacies. Before examining what I saw in the practices and what transpired in the game, there were other participants in the event’s Regional and International games that made quite an impression. The Regional contest showcased talents from the fertile soil of North Carolina, and 6-foot-7 forward Montrezl Harrell, who’ll play next year for Virginia Tech, made a case for being a glaring omission in the headlining National Game. Harrell was not merely impressive because of his state line of 22 points, 12 rebounds and seven blocks. His physicality, athleticism, grown-man strength and rare explosiveness, along with his refined skill set as a scorer, rebounder and shot blocker, all point to him potentially being a dominant power forward in the ACC from the giddy-up. Big man Peter Jurkin, a 7-footer and raw prospect who will play for the resurrected Indiana Hoosiers and coach Tom Crean next year, is still very much a work in progress. But his size, wing span, fluidity running the floor, shot-blocking and rebounding prowess are indicators of his vast potential and chance to possibly blossom into a special talent in the years ahead. 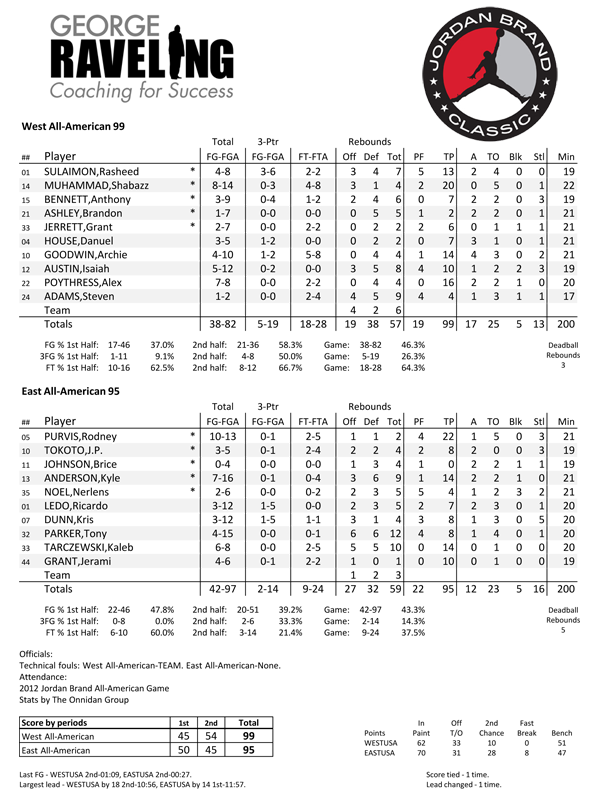 6-foot-4 shooting guard Jarvis Haywood, who’ll play at Jacksonville next year, Mike Brown, a 6-foot-3 guard who’s headed to Western Carolina and Montay Brandon, a 6-foot-5 wing who’ll play at Florida State, were also impressive. 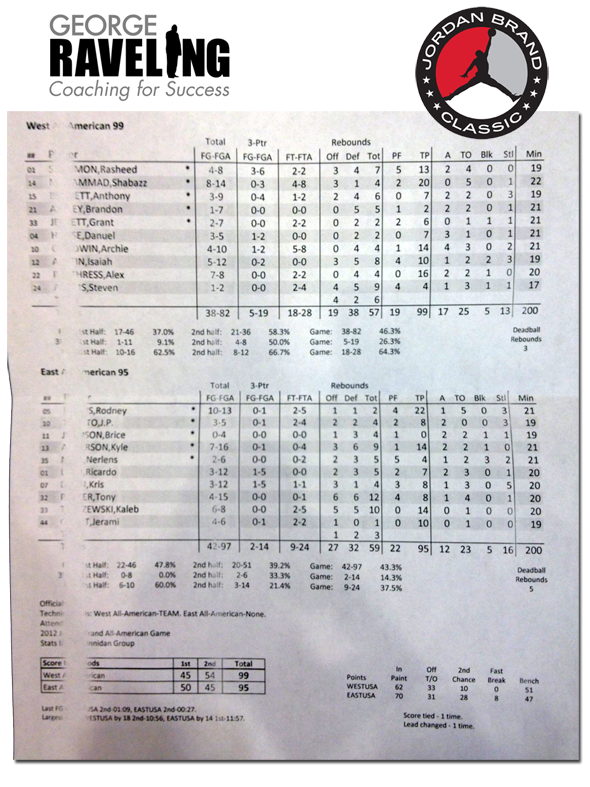 The East Regional team, led by the Harrell, who played like a man among boys, defeated the West Regional team, 84-82. 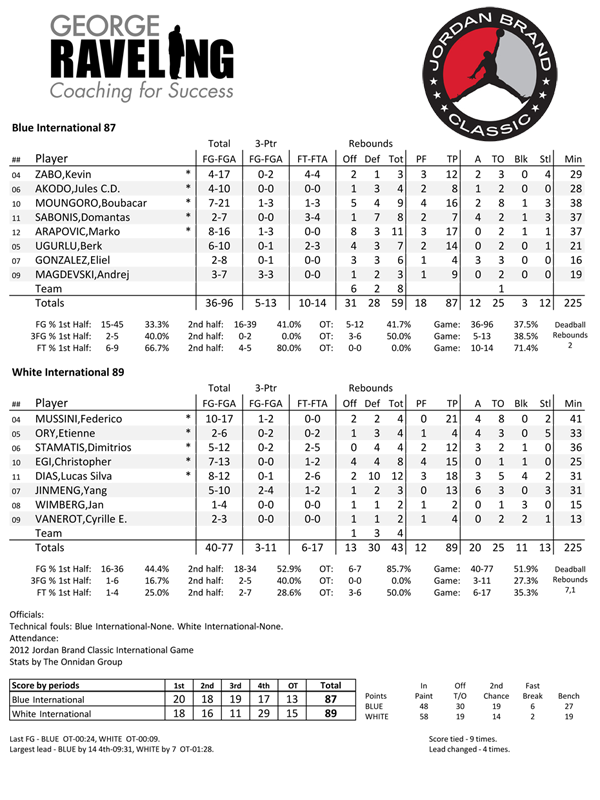 The International Game, featuring some of the world’s elite 15 and 16-year-old’s, was very well played and entertaining, an 89-87 overtime affair won by the White International squad coached by the brilliant Herman Harried, the head coach of Lake Clifton High School in Baltimore. Italy’s Federico Mussini is a 5-foot-11, 140-pound guard who looks as menacing as Justin Bieber, but on the court, he’s an ice-cold assassin with a lethal scoring arsenal who understands how to create just enough space to squeeze off his delectable jump shot. Mussini finished with a game-high 21 points. Greece’s 6-foot Dimitrios Stamatis was strong in transition, attacking the rim with confidence, China’s 6-foot-3 Yang Jinmeng impressed with his ability to score and pass and Canada’s Christopher Egi and Brazil’s Lucas Silva Dias, who both stand 6-foot-8, also impressed with their scoring and rebounding for the victorious team. The Blue International team was paced by strong efforts from Mali’s 6-foot-6 Boubacar Moungro, Croatia’s 6-foot-8 Marko Arapovic and Turkey’s 6-foot-1 Berk Ugurlu. Puerto Rico’s 6-foot-3 guard Eliel Gonzalez looked solid in the practice sessions and has a chance to be a very good D-I point guard. The cool thing about the international aspect of the Jordan Brand Classic is the eager and earnest way the players prepare for the game, how receptive they are to the coaching and the way they overcome the language barriers to communicate with one another to play some great, team basketball. In the main event, which was televised in prime time by ESPN, we were treated to some very unique talents. Shabazz Muhammad, the West MVP, led his team to a 99-95 victory with 20 points while Rodney Purvis, the East MVP, led all scorers with 22. Each player invited earned their distinction and there’s no doubt that success will follow most on the college level, with a few headed towards certain star status on the professional level. CoachGeorgeRaveling.com sat down with a few of the Jordan Brand All-Americans, where they had a chance to talk about what the experience meant to them, their goals for the future and what they’re working on to improve, among other topics. Shabazz Muhammad is a 6-foot-6 swing man from Bishop Gorman High School in Las Vegas who is widely considered the best player in the class of 2012. In a fast paced game, he terrorizes opposing defenses and attacks the rim with authority. The rangy lefty is equally adept in the mid-range game and also impacts a game defensively. Heading to UCLA next year, he should be one of the best players in the PAC-12 from day one. “I have a love and passion for the game. Having this opportunity to be here on this big stage and play, knowing that most people don’t get this opportunity, I’m not taking it for granted. Looking back at the players that have played in the Jordan Brand Classic, having this Jump Man logo on our uniforms, knowing everyone wants to wear Air Jordan’s, knowing what it represents and how guys like LeBron, Carmelo, Chris Paul and those guys that really did good in this game and, I think this is a really big opportunity for all of us, to be among the best of the best. This was a step that they took in their career and now we’re following in their footsteps. High school basketball was a breeze for all of us, and now dealing with the college level is going to be a challenge. High School went by so fast. I remember being a freshman and now we’re off to college to do what we have to do to succeed at the next level. On the next level, guys are just as tall and just as athletic, so I’m really working on honing my skill set. Rasheed Sulaimon is a 6-foot-3 guard from Strake Jesuit College Prep in Houston, Texas who will be playing for the Duke Blue Devils next year. He has extensive shooting range, can attack the hoop in an open-court, fast paced game and is very proficient at hitting pull-up jumpers. “I love the competitiveness of this environment. To have the opportunity to play at the level we’re playing at right now is great. What makes this game so special is Michael Jordan. He’s such a great ambassador for the game and changed the game in so many ways, on and off the court, as a player and as a businessman. The quality of the players that have come through here, just to be considered along with those guys is a real blessing. Nerlens Noel is a 6-foot-10, shot-blocking phenom who attends the Tilton School in New Hampshire. Nerlens, a Massachusetts native, is the state’s best big man defensive prospect since Patrick Ewing. He has an uncanny intuitive feel for blocking shots along with magnificent overall defensive instincts. His long arms, athleticism and ability to burst off the floor with uncanny quickness are things that can’t be taught. He’s also very mobile for a guy so long and thin. Nerlens is great finishing fast breaks on the alley oop and is a deceptively good passer. It seems that Coach Calipari has another shot-blocking monster headed to play for him at Kentucky next year in Noel. “The transition to playing at Kentucky next year is something I’m looking forward to. It’s going to be tough and there are a lot of things that I’m going to have to pick up real quick. Right off the bat, you’ve got to be physically and mentally ready to get up to the speed that they’re playing at. I love the intensity of what I’m going into. I’m not intimidated walking into that environment, I think it’s just going to push me harder in order to live up to the hype and expectation and I know I’m not going to have an easy way out. J.P. Tokoto is an athletic marvel. The 6-foot-6 wing man from Menomonee Falls High School in Milwaukee will be one of the most electrifying fast break finishers in the country next year, when he suits up for the North Carolina Tar Heels. J.P. has penthouse-level strength and athleticism, and the aesthetic of him in flight can take your breath away. He plays above the rim with a style and flair that few can claim. “I’m happy for the guys from Carolina that are leaving early to play in the NBA, but at the same time, I’m a little sad because I was looking forward to spending time and playing with them, especially talking to Harrison Barnes , learning a few things from him about how he handled some of the adversity he went through in college, some things that I may have to go through. But just because those guys are leaving, there’s not going to be a change in terms of what’s expected, and that’s Final Fours and National Championships. College is going to be a more physical game. I have a trainer that I work with for about two hours a day, and then I’m in the gym working on my ball handling, mid-range game and trying to expand my shot beyond the three-point line. I’ve always been able to see the court and I like to get my teammates the ball, and I’m continuing to work on being a facilitator and passer as well. I’m also working on my lateral movements on defense, so I can beat the guy to the spot that he’s trying to get to and not trying to reach as much, just looking for the highlight play all the time. Kyle Anderson is one of the most unique talents to come out of the high school ranks in years. The 6-foot-7 guard/forward from St. Anthony’s High School in Jersey City, New Jersey will be playing alongside Shabazz Muhammad next year at UCLA. His floor vision is exceptional and his ability to boogie on the low block, handle the ball and facilitate for others is a joy to behold. He might not be among the fastest or most athletic guys, but with an assortment of moves he can use to score from anywhere on the court, crisp passing and smooth jump shot, he reminds me, due to his rare combination of size and skill set, of a young Lloyd Daniels. That might be an obscure reference to some, but just ask Jerry Tarkanian or anybody in New York who saw or played with or against Lloyd Daniels, and they’ll tell you about a young man blessed by the basketball gods. “It means a lot to have been chosen as a Jordan Brand All-American, a lot of great players have played in this game. When I was 11 years old, playing at the National Championships in Cocoa Beach, Florida, that’s when I really start to take the game seriously and realized I had a chance to do something special. I love watching players at the next levels, to see what they do well and try to add those elements to my game. Right now, I’m working on getting quicker and being more explosive, playing through fatigue and making open shots. I want to be able to make 90% of the open shots I get during a game. Isaiah Austin, a 7-foot center from Grace Prep in Arlington, Texas who will play for Baylor next year, has an unbelievable ability to run the floor to go along with ridiculous athleticism. When you couple that with his remarkable size, you have a young man with abilities to do things that most only dream about. He can handle the ball, shoot three’s, rebound and give opposing teams nightmares with his mind-boggling wingspan and instincts on the defensive end. “It’s an honor and a blessing to be a part of this All-American game. We’re all having a great time being out on the floor together. We’ve been on the AAU circuit for many years with each other and this our last time to be together before we head off to college, so we’re here having a lot of fun. When I’m in the gym by myself, I’m pushing myself to the limit, because that’s the only way you’re going to get better. I do a lot of rebounding drills, cone work and footwork stuff. I’m in the weight room as well as doing a lot of conditioning. I’m just trying to get better all around. Anthony Bennett is a 6-foot-8 Canadian native who attends Findlay Prep in Henderson Nevada. He plays with a mixture of smooth finesse and brute strength that makes NBA scouts drool. His upside is huge, given that he’s still relatively new to the game and elite competition, yet can bully his way inside the paint for buckets and boards against the nation’s best. And if he’s coming at the rim with a full head of steam on a fast break, I would advise any defender to get out of the way. Bennett is a very good free throw shooter and has great form on his three-point shot. If he becomes a consistent shooter from long range, people might be looking at him ten years from now, wondering why Nerlens Noel and Shabazz Muhammad got all of the hype in 2012. Bennett will be making his college choice in a matter of days, with Kentucky, UNLV, Washington, Oregon and Florida vying for his services. “I’m here to have fun and enjoy being around these guys. When no one else is around and I’m working on my game, I’m trying to improve my ball handling and having a consistent jump shot. In my mind, when I’m in the gym at night at Findlay Prep, I’m envisioning a full arena and I’m taking the last shot. And it’s going in. That’s the dream I always have, where the last shot, the game-winning shot, goes in and the crowd is going crazy. I like getting an assist, seeing my teammates score off of something that I created for them. I’m happy seeing my teammates happy after they score. Two years ago is when I realized that I could be a special player and really started working on my game. Going to Findlay Prep really helped me. Coach Peck is a great coach who teaches you a lot of things about basketball and life. Things like respecting everyone else and staying poised when things aren’t going well. I played against one of the best players in the country every day in practice, Brandon Ashley who’s going to Arizona next year who’s also a Jordan Brand All-American, and that made me better, both offensively and as a defender. Alex Poythress is a 6-foot-7 forward from Northeast High School in Clarksville, Tennessee who’ll play for the Kentucky Wildcats next year. His athleticism is wondrous and he has great size and strength that allow him to excel in the open court, as well as being very effective in the half-court as well. Known for his attack the rim mentality, Alex is also adept at playing on the perimeter. When his jump shot is falling, he’s virtually unstoppable. “It’s a great honor to be here, to be considered among the top 24 players in the country. It’s a very humbling experience and I’m just trying to soak it all in. Watching Kentucky win the National Championship was exciting for me, and I’m just hoping that can be us next year. I’m in the gym working on improving, working on one-dribble pull-up jumpers, conditioning, running, doing sprints, shooting three’s, executing moves off the dribble. Over the next few years, I just want to improve as a player. Rodney Purvis is a 6-foot-4 guard at Upper Room Christian Academy in Raleigh, North Carolina who will be playing for North Carolina State next year. His talents are unmistakable, with rare speed and the ability to slash through defenses like Freddy Kruger. Rodney can finish around the rim no matter who’s there waiting for him, and he can also pass the ball extremely well. “This was a great experience for me, a cherish-able moment. I’m from this area and live about two hours away, so it was great for my family to be here and have the opportunity to see me. Michael Jordan is the greatest to ever play the game, so just to have on this uniform is an honor. When I woke up this morning, I thanked God for giving me this opportunity. It’s been a great high school career for me and it went by so fast. Right now, I’m just doing what I have to do to get ready for the next level. In college, everybody jumps as high as you, everybody’s just as fast as you, so I’m concentrating on doing the little things that are going to separate me from everybody else. This is what I want to do with my future, so I’m putting in that hard work with determination. This was a huge confidence boost for me, heading off to college. Some guys get to this level and fade away and I’m definitely not trying to let that happen to me. I plan on staying close to God and working on my game. Senior Writer and Editor with The Shadow League. The former Senior Editor of Bounce Magazine, he is also a Freelance Sports and Entertainment Writer whose work has been published by the New York Times, Bleacher Report, Sporting News, Baltimore Sun, Associated Press, Los Angeles Times, SLAMonline and Ebony Magazine, among many others. His Shadow League feature story, "Humble Beginnings", was mentioned in the Best American Sportswriting anthology as among the country's most notable sportswriting in 2014. Stay in the game, no matter what position you play.